In Wilderness, 2 to 8 players race to the nearest civilized village. But the village is not close, and the way there is not paved. You will have to find water, hunt for food, avoid wolves, bears, and snakes, endure sickness, and keep your strength up to be able to get there. Each player’s health is kept track of with 3 parameters: thirst, hunger, and strength. Every turn you get more thirsty, hungry, and fatigued. The thirstier and hungrier you are, the more tired you become, and that determines how many action points you have each turn. If your strength hits bottom, you die. The action points are used to walk, but also to hunt or rest. To regain your strength you also have to sleep. The game board is discovered gradually as players progress across it, and there are 6 turns each day (4 day turns, 2 night turns). Each day has different special rules, and each board segment has its own challenges. Each board segment has 21 hexes in a big triangle and each hex has a terrain type like mountain, woods, swamps and so on, and the segment may also include a predator lair. Different terrain types have their benefits and challenges. The combination and orientation of different board segments make the way forward uncertain and new every game. To top it off, the players have a limited supply of cards that can be played to help themselves or thwart opponents. You can play with either 4, 6, or 8 board segments. 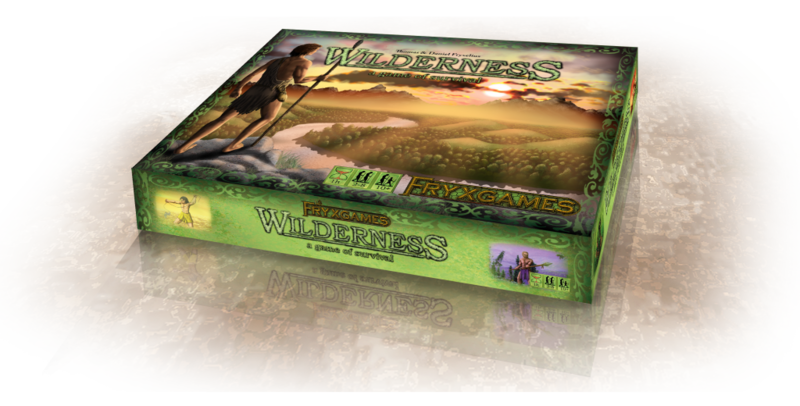 FryxGames wants to direct a THANK YOU to all who have supported the first print run of Wilderness. Their names appear on this page. 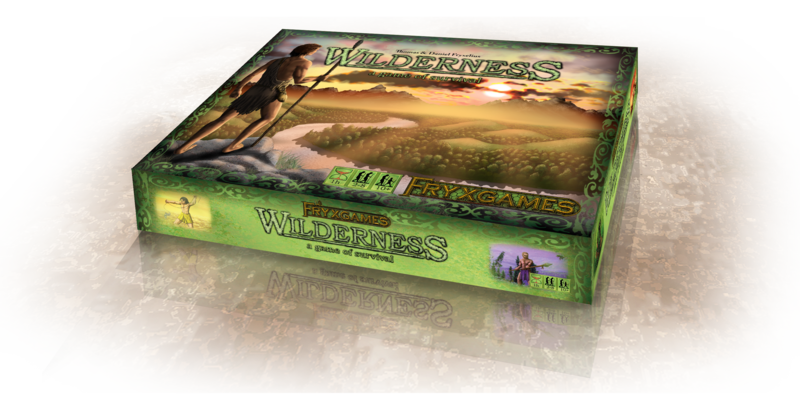 Visit Wilderness on BoardGameGeek to see more, rate and comment.